I recently taught someone how to mold chocolates. This was their first time doing it. The mold she used had 2 sizes of crosses on it. 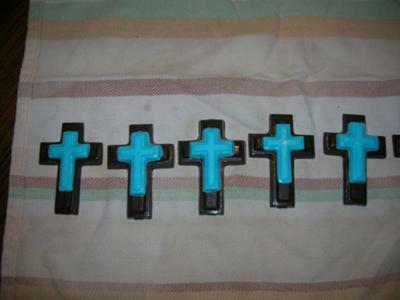 The person was doing the pieces in blue and dark chocolate and came up with the idea of putting the small cross on top of the big cross. You're right! The look of the smaller molded chocolate cross mounted on top of the larger chocolate cross is very effective. It gives it a real 3D appearance, too. I love that you can use molded chocolate candy for Christenings, or almost any other occasion as well. Chocolate crosses for a Christening party was a very appropriate choice! There's such an amazing selection of candy molds these days that you are sure to find something that would suit almost any event. I love browsing through the thousands of molds at Candyland Crafts. It inspires me with ideas for party themes, too. I'm so pleased that you are sharing your creations and that you are even teaching others how to mold chocolate candy. It's such a fun and delicious past-time, yet so easy, too.